#Andra Pradesh KGBV Norms of Food. Salaries, Medical Care, Teaching aids,Water, Material ,TA bills and Stationary Training etc. Forms. Sub:- APREIS-KGBV, Hyderabad – Communication of Financial Norm and Operational for the year 2015-16 – Orders –Issued. Ref:- Letter Rc. No: 2809/APSSA/KGBV/2015, dt: 29-06-2015 of the State Project Director, RVM (SSA), APKGBV, AP., Hyd. All the Special Officers of K.G.B.V. in the state of A.P. 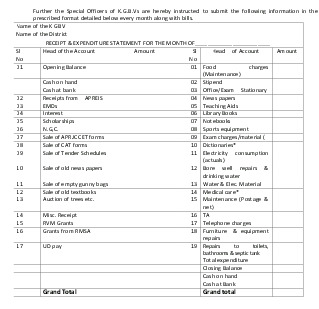 are hereby instructed to follow the financial norms and Operational Guidelines enclosed are adhered to scrupulously for implementation in all A.P., K.G.B.Vs for the year 2015-16. The same may be assessed through website.